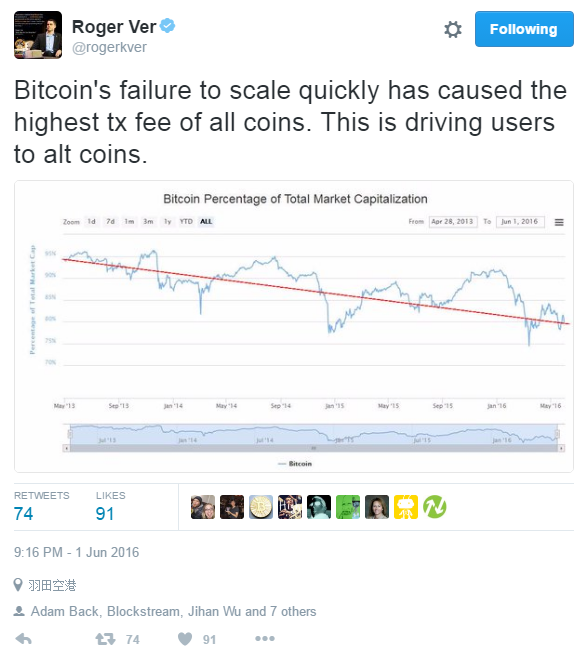 Roger Ver, the delusional guy that lies more in a single day than Mark Karpeles did in his entire life, is at it again. Most of my dear readers have probably heard about Roger Ver, otherwise you wouldn’t read this article, but maybe not everyone knows the full story. Roger was born in the US, moved in 2005 to Japan, bought a St Kitts and Nevis passport and renounced his US citizenship in 2014. Roger is also an ex-convict, he was sentenced to 10 months in prison for selling explosives on Ebay. Those explosives were illegal fireworks, which doesn’t sound that bad, but imagine you or someone in your family being a delivery guy unknowingly carrying/delivering illegal fireworks, sounds a lot worse now doesn’t it? Critics might say that it was a long time ago since it was in 2002 and he was young and stupid. All this might be true but I think it’s important to paint the complete picture of how he thinks and acts. He was an early investor and adopter of Bitcoin, his website was one of the early ones that accepted Bitcoin as payment. According to some well-informed people his total worth was around 400,000–450,000 BTC back in 2014. Of course since then he has funded some Bitcoin companies and probably spend a good chunk of it. 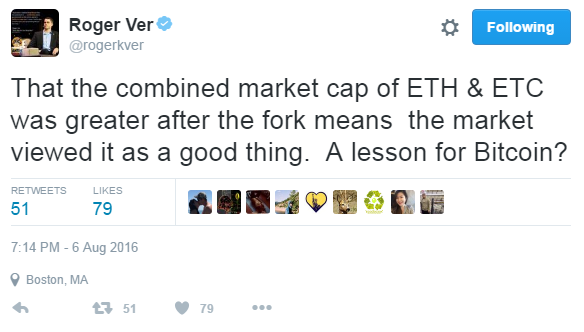 Ver has been a very vocal Bitcoin advocate for many years and that’s why he was named “Bitcoin Jesus”. However his narrative has changed over the last couple of years: from being a positive force trying to push Bitcoin forward, he has now become a negative force trying to cripple the system. I know that this is a boring topic and it has all been discussed a million times and a million times Ver has been proved wrong but I’ll give you the tldr;. 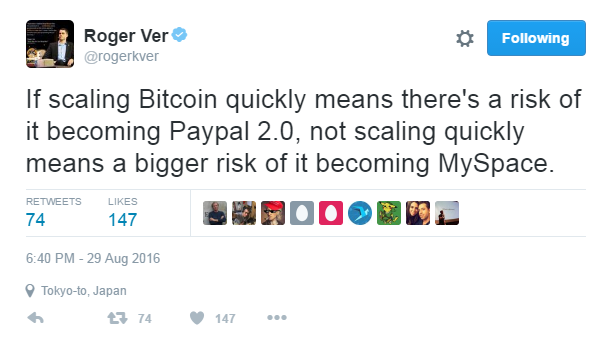 Ver wants an immediate blocksize increase so everyone can pay for their coffee with Bitcoin with no fees. He doesn’t realize the impact that has on decentralization, blockchain bloat, processing of blocks on nodes,… Bitcoin Core wants to work on a sustainable solution with, potentially, later a blocksize increase but first there has to be work done on efficiency. 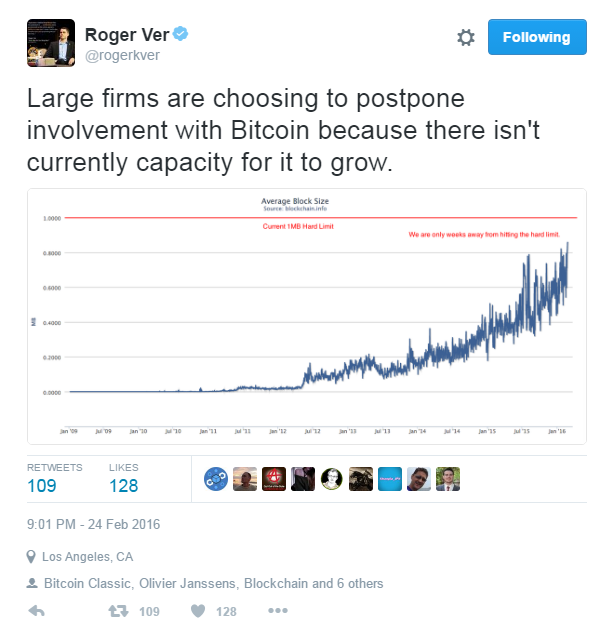 Roger is a broken record saying that people have stopped using or investing in Bitcoin and switched to altcoins, never providing any proof of this statement. And if people stopped using Bitcoin, wouldn’t that mean that there would be more room in blocks? “We must stop the fee market!” — if you take even a second to think about it, if we would increase the blocksize now to 2MB, everyone would realize it would be full again immediately. Lots of exchanges and other sites need to learn to optimize their processes so they are more efficient when it comes to handling Bitcoin transactions. The idea behind is that Satoshi in his whitepaper said that Bitcoin is a peer-to-peer cash system. The idea behind it is great, but that was written almost a decade ago and Satoshi wrote it before the current Bitcoin ecosystem was built. They will argue that Satoshi hinted at a blocksize increase himself in one of his later posts, and that might be a good idea, after the optimization. This is the very short version, but that’s where it started. 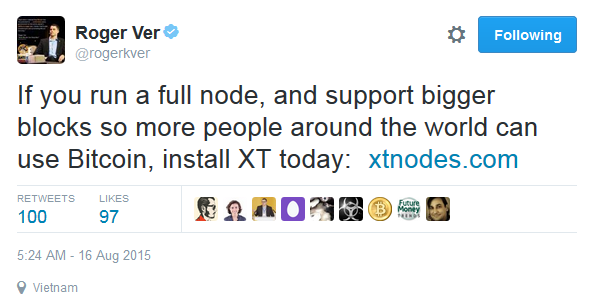 Bitcoin XT was created by Mike Hearn and Gavin Andresen in an attempt to aggressively increase the blocksize to 8MB. 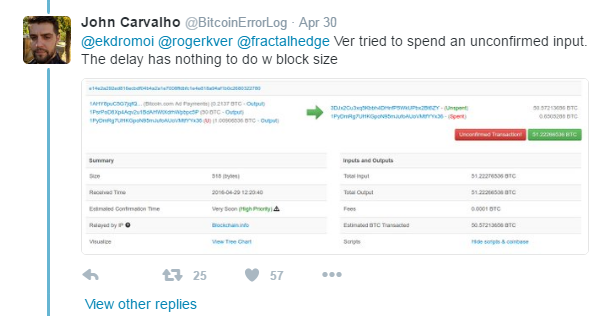 Roger Ver supported it, it never caught on. Around the same time he started complaining and blaming the censorship on Reddit /r/bitcoin for this failure. Bitcoin Classic was the next attempt. Instead of increasing it to 8MB they now tried to argue that 2MB was a good idea. In March 2016 they managed to get 7% of the total network hashing power to support them at that was it. 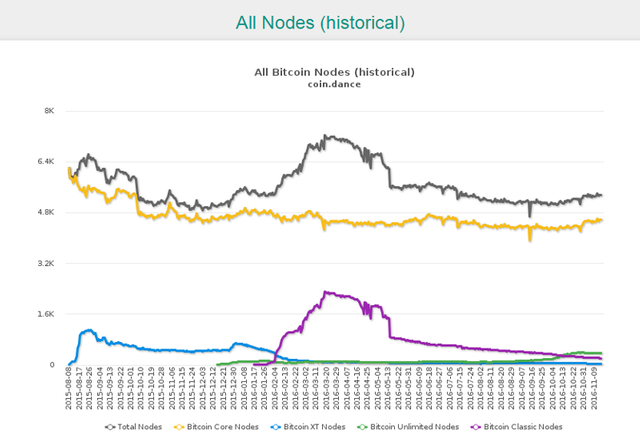 The most noteworthy achievement is that in a very desperate attempt they tried to set up as many fake nodes on AWS as they could to try to look more popular as they ever were. For the record: you can run as many nodes as you want, if they are on AWS they are extremely centralized and basically useless. Bitcoin Unlimited is the latest (soon to be failed) attempt, this time they tried bribing. Bitcoin Unlimited received a “500,000 usd donation” and now additionally there is a 1 million dollar grant for alternative implementations. I think this kind of falls under the “bribing” part that I will discuss later. Let the experts do their thing and test everything properly, I will leave you with a tweet from Peter Todd on this subject. This is another favorite subject of the little Roger who cried wolf. He complains that there is (too much) censorship on /r/bitcoin. This started after Bitcoin XT was launched. 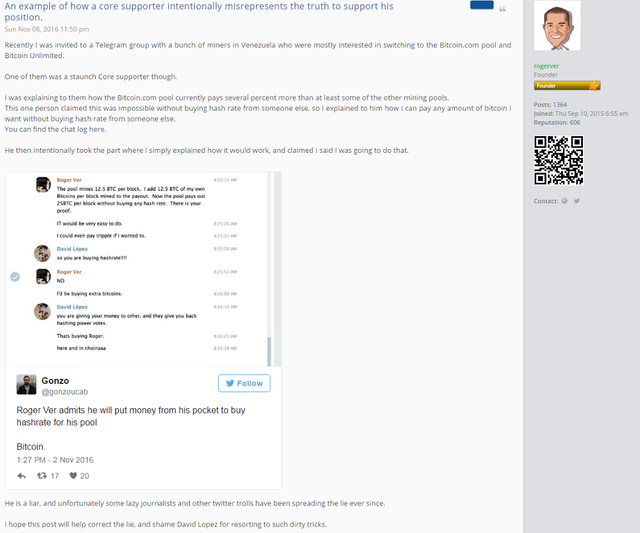 He blames Bitcoin Core for supporting it and being against free speech. Bitcoin core obviously has nothing to do with it, it consists of 60+ developers of which there are 8–10 that are doing most of the work. They are focused on developing and are way more active on the public Bitcoin mailing list than on Reddit, as they should be… since they are developers and not community managers or PR people. 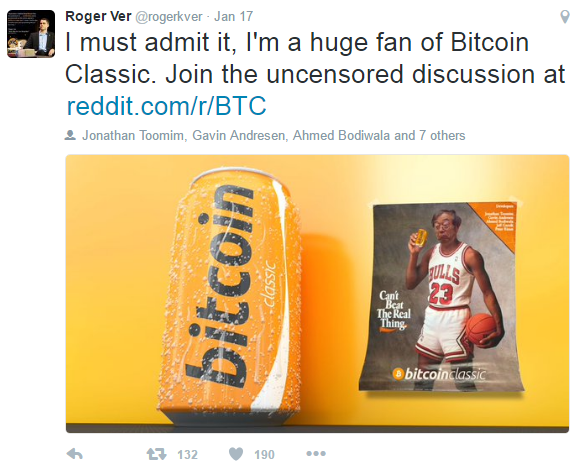 Of course Bitcoin Classic is already dead at this point but anyway he took over /r/btc where there is full free speech, or so he claims. Unless you point out that he’s wrong, that one of the mods was a scammer or anything else they didn’t like. Then your posts would get removed and you would get shadow banned. Now that they opened up the moderation logs it has been become more “subtle”, voting bots vote up every comment made by Roger or Olivier Janssens in seconds and vote down any comment made by someone on their “naughty” list. Before you check out /r/btc though I have to warn you to wear protection, or you might catch something nasty and lose all hope in humanity. 90% of the posts are people whining about Blockstream/Blocksize. Censorship and moderation is necessary to some extend. Even 4chan is being moderated and posts are being removed. This is the internet, this isn’t utopia. 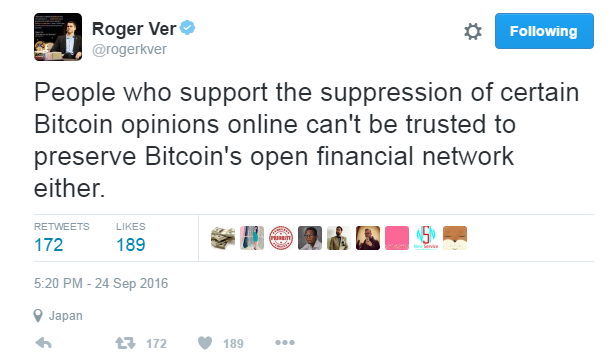 Bitcoin opinions shouldn’t be suppressed! Unless they go against mine then they should be shut down immediately and people should get fired! In the beginning of this year we had the Hong Kong meetup and agreement. A couple of Bitcoin Core devs had a meetup with a couple of Chinese miners to discuss scaling. 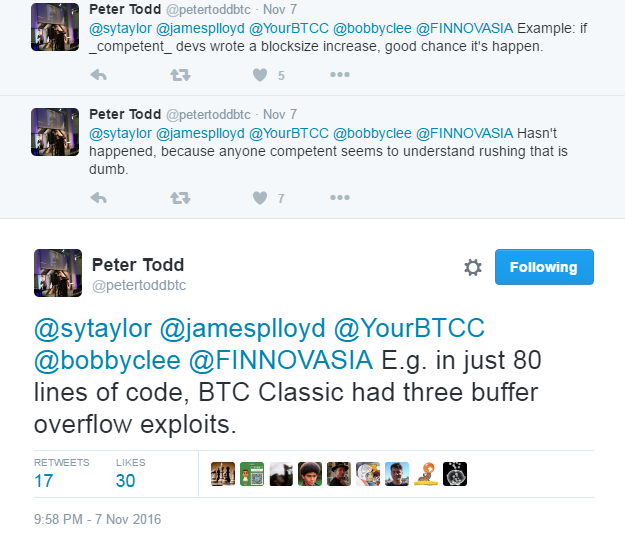 This was heavily criticized by Roger Ver, /r/btc and other Bitcoin Classic supporters. Since they felt left out, even though they were being invited. A few months later however Roger Ver went to China, did exactly the same and acted like it was completely normal. The only person that he managed to “turn” was Jihan Wu. Jihan had been very critical of Bitcoin Core and said that he felt pushed into the Hong Kong agreement, even though I didn’t see any guns or other weapons that forced him. Another couple of weeks pass and suddenly ViaBTC is born, a completely new Chinese pool that, out of nowhere, has around 7–8% of the global hashrate. It has been spewing out Bitcoin Unlimited propaganda on Twitter and on Medium posts and has been mining Bitcoin Unlimited blocks. A new pool coming out of nowhere running an alternative implementation is very suspicious indeed. It was pretty clear that this was part of another push by Ver who this time works together with Wu. They have mentioned that they will only accept Segwit as a hardfork. Meanwhile Bitcoin Unlimited, not having any capable devs, is not planning to implement Segwit in their implementation, thus trying to block scaling. Roger Ver owns Bitcoin.com, it’s that simple. Be very critical of any news related articles on that website. Some of them are decent, others are just pure propaganda for Bitcoin Unlimited/blocksize increase and some are just PR pieces for one of the many companies Roger invested in. In a desperate attempt to monetize the website, they made an online casino on it. 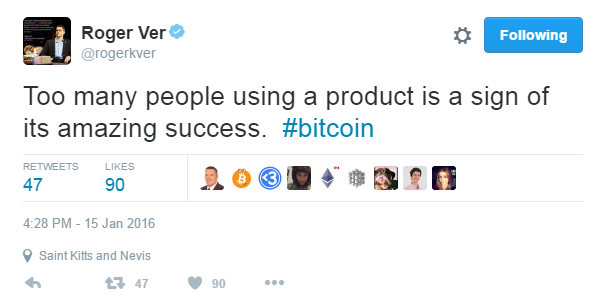 A bit odd since a small minority uses it… Oh but wait that’s the one Roger Ver is pushing… Now it makes sense. Bitcoin.com also has a mining pool which runs… Bitcoin Unlimited, how could you have guessed. But sadly no miners are interested in mining on his pool… How would you change that? 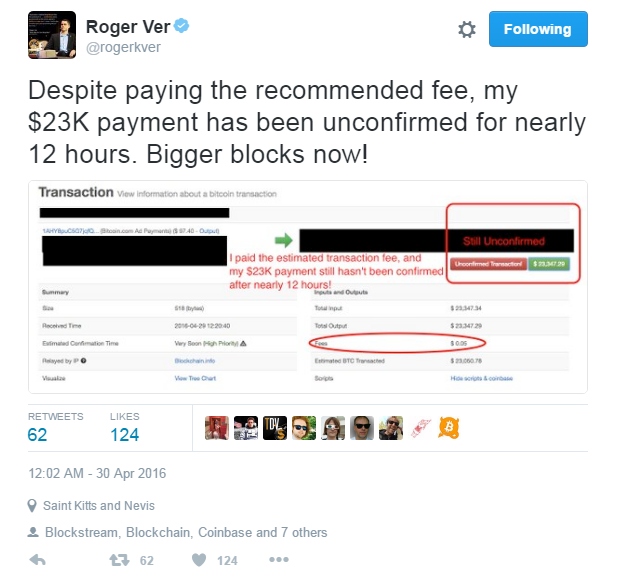 The Roger Ver way is of course: bribe! You can call it buying hashrate or you can call it a bribe… I call it a bribe. He’s allowed to of course, just says a lot about him. This is a fun one. 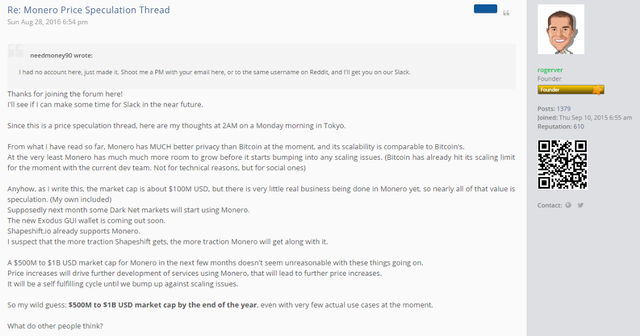 Because Bitcoin was so popular that no one was using it anymore and everyone was running to alts as Roger mentioned, he was pushing his belieVers to some altcoins including Ethereum and Monero. That was when bitcoin was $550, at the time of writing Bitcoin is $715. And it’s very very far away the 500 million to 1 billion that he predicted even though we are now “in the next few months”. The marketcap before was $1.1 billion, the marketcap afterwards was $1.2 billion. The combined marketcap now is $ 920 million, but again Bitcoin was a lot lower back then. Ethereum price then: 0.0187 BTC now: 0.0139 BTC. Ethereum Classic price then: 0.0045 BTC now: 0.00127. It’s probably smart to countertrade him on altcoin calls. Yes because making it more costly to run a full node will make more people do that? Roger Ver logic. No proof. “Large Firms”… Ok then. So he’s either incompetent or a liar… Good to know. That’s really not how it works. A lot more money in crypto and a lot more interesting projects. If Bitcoin is in a bear market, money flows to alts. More users = higher price: Not necessarily, more users now than in 2014. 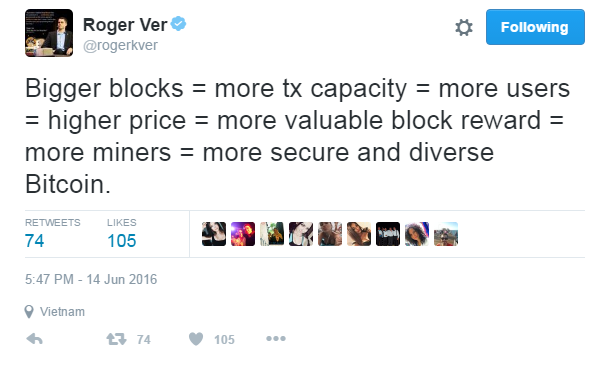 More miners = more secure and diverse Bitcoin: Again, no, bigger ones will get bigger. This is the perfect conclusion for this section: If you want to run untested software with a huge chance of DAO-like/Ethereum-like failure then yes, follow Roger Ver and start using Bitcoin Unlimited. If you prefer to actually help Bitcoin grow, support the Bitcoin Core devs who have a lot of experience, are the brightest minds in the industry and test their software thoroughly. A couple of months ago I was talking with a Bitcoin developer, he claimed that he had a source close to Ver that said he was starting to lose it. His recent actions are just more proof of that. The lies, the bribing.. He is like a cornered animal, but one with a lot of money. Maybe he’s just not that smart. Maybe he really believes that he is right and just delusional. Maybe he’s trying to get even more cheap Bitcoin, maybe he’s trying to push people to ZCash/Ethereum/Monero. Who knows. Truth is that, in my opinion, he’s one of the biggest threats to Bitcoin in the community. God, watching Bitcoin sweat is getting boring fast.